We hung curtains in the kitchen at the sliding door! My grandmother would be so happy right now! She always thought it was 'creepy' (my word) to not have a curtain here. These are not perfectly styled photos (the curtains need to lose their wrinkles still) and its an awkward place to photograph with the trash can to the right and my aloe plant wintering in the house to the left. I did want to post to document one more project for the year. I also want to wish Emma and Vinnie a Happy Anniversary! Two years already! We don't usually have the tv in the living room, since we only use it for movies. It's usually in our bedroom sitting area. Because our friend will be recouperating and staying in the master bedroom suite, we moved the tv to the living room, so we can feel free to watch a movie anytime. Of course moving the tv has lead to rearranging the sitting area of the master. The tv and cabinet are usually along the wall where the couch is. I'm trying to decide if I hang something on the wall, or leave it blank since this is only a temporary move. Of course, seasons of life change, and you never know, we may leave the tv in the living room. This will be my last post for the year, as I'm leaving on my anniversary trip tomorrow! I've been blogging for 10 years, and am so thankful for the friendships and sisterhood that are a huge part of Creekside Cottage! Happy New Year, friends, and may you know God's goodness in the coming year. I love to hold on to Christmas until after New Years, but this year that's not happening. Well, I should clarify that not all the Christmas is going away, just the tree. We undressed it and it is now providing a lovely habitat for birds and other creatures in our pasture. We have several things happening that I need to prepare for and that necessitated my taking our Christmas tree down. I was so sad to see it go. The things I needed to prepare for are my anniversary trip to Florida and our friends' knee replacement surgery in early January. Tim and I fly this weekend to spend a week away to celebrate 30 years. We'll get to see his mom and other family, and we'll be staying with our dear friends in their home. We have some fun things planned and some days unplanned and we're okay with that. We have someone staying here with the kids while we're gone, and they're already planning the fun they'll have New Year's Eve and other days. I’m borrowing this phrase from Vee - it suits my thinking! We had a very good day yesterday. Lots of cheer with the kids, the grandgirlies, and my parents all here. Our friend Denny was with us, too! This week there’ll be movies, and other fun. Next week Tim and I will celebrate our 30th wedding anniversary. Not sure how that happened because in my mind I’m only 30 years old! It raining here today, but hopefully it is going to stop this afternoon. The kids are planning an airsoft battle amongst themselves! We're excited that the forecast for Christmas Eve into Christmas Day is saying a light snow! Isla has arrived in town, bring her parents along with her! She has been having fun playing with Uncle Kyle, hanging with Auntie Sarah, feeding the horses with Grandpa, and giving the chickens some oats. Tomorrow, the whole family and some friends are going to lunch to celebrate Tim's birthday. We're very pleased that his brother Dan and family will be with us for that! Then we have an early Christmas Eve service at church, then home for birthday gifts and later, stockings. I use my trough as a centerpiece all through out the year, just changing up what is in it. For most of the month of December its been full of fresh greens, dried orange slices and candles. The greens had seen better days so I decided to change out the whole thing, and I knew just what I wanted to try. I follow Layla Palmer of The Lettered Cottage on Instagram. She does great stories and is sweet and funny. This past week she showed her home decorated for Christmas and the centerpiece on the dining table caught my eye. You can see it in this post from her blog. She used foam balls covered in bits of rolled yarn (to look like balls of yarn) in a wooden crate with candles. She also added greens in with it. I have lots of yarn ball remnants from my many projects and I knew that I could come up with something that looked good. I'm liking the way it looks and I plan to use it all through winter. The cheerfulness of the lights and greenery we use at Christmas time, really helps make the season special. Here is another view. I make this plaid scotty garland last year! I delight in making 'spirits bright' at Christmas. I have had such an enjoyable time, ordering gifts, popping into shops, looking for things that have meaning for the people I love. I sent a package or two, lots of family photo Christmas cards, I've baked dozens of cappuccino muffins, and brownies to give as gifts. I know there are people who do not enjoy the holiday if they don't have children or grandchildren, but I think that we can create a lot of joy of the season for others if we will reach out and find someone who needs cheer. Our world is in need of hope, and we know the ultimate source of hope - God's gift to the world - Jesus. Let's try to remember year round that people need to know about the hope that is within us. In my dreams I have a scaled down version of the fireplaces at Cracker Barrel! I love the hearth the big open firebox and all the stone! Dreamy! But back to reality. I wanted a place to use a garland with lights and add a bit more sparkle to the living room, so I decided I'd use the top shelf of my bookcase. Sometimes, you just have to think outside the box. Emma, Vinnie, and Isla are driving to Pennsylvania today. I'd appreciate prayer for their safety while traveling. They'll be here for a week, then go to Vinnie's family for New Years. I have a few gift cards to pick up still but otherwise I'm done with shopping and wrapping. I enjoy it so much! I love giving gifts to family and friends! Are you getting excited? I am! I've been enjoying my preparations for our Christmas celebration. I have just a few things to pick up, then Friday when I get my groceries, I'll also pick up some special treats and food items that we will enjoy on Christmas day. I've been wrapping gifts, and ordering things. I've been knitting, and listening to music, and baking. This year is also special because all our kids and grands will be here on Christmas Day, and they'll be here to celebrate Tim's birthday the day before! My parents will be here too, and it will be fun to watch the little girls toddle around the house, talk and laugh with the older kids and enjoy each other. I have several Nativity sets. My first one was a gift on my 21st birthday. My family and friends went in together and bought me a Precious Moments nativity. I still have it, though I don't often bring it out as I have limited space. My next one was a bit more grown up. Fancier and gilded, with wisemen, a camel, an oxen, sheep. I used to put it up over the cupboard in my kitchen because I didn't want it to break. You've seen my sweet handmade gift from Kayleigh (my daughter in law) and my Fisher Price one. Both are hands on for my grands. I have one more that my sweet friend Amy gave me. It is a Willow Tree one. I'm loving this one as I feel like it is simple and humble. Like Mary and Joseph and the shepherds. The simple people who trusted God's message to them, though it involved risk. Jesus born in a stable, among animals, and filth. Laid in a feed trough, wrapped in cloths. For many years now, we've been hanging our stockings on this old ladder. 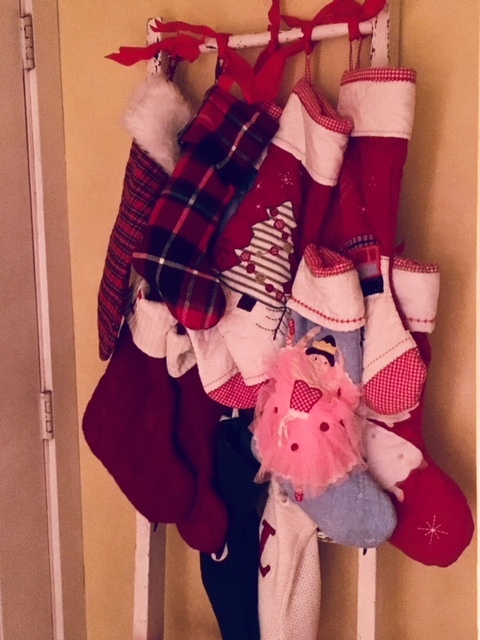 We don't have a hearth or a banister in our cottage so this is how we handle our stockings. On Christmas Eve, we all gather here and open our stockings. Everything from socks, to gum, to earbuds, to new toothbrushes. You never know what you'll find in your stocking. Most of the grown ups buy stuff to put into the stockings. Do you do stocking gifts in your family traditions? What kinds of things do you put into your stockings? How could I not enjoy it with this view? I get to see this every day and I'm loving it! I find that in order for me to enjoy this season, I need to have little expectation for what it 'should' look like. The realities are often very different and that can be hard to reconcile with our expectations. 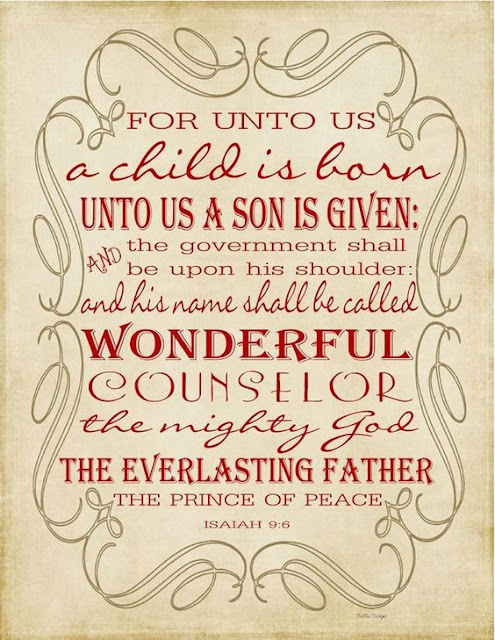 If we can learn to hold these expectations loosely, and trust God with them, we can have a good Christmas, even a wonderful one. Sometimes it's other peoples expectations that we are dealing with. Perhaps we have family that don't share our values, or who think we're the odd relatives. Maybe you have an aunt that is critical of you but always expects to see you and your family at the holidays. These photos were taken on Thanksgiving Day. Tons of leaves in the yard! They are now all raked up, but the girls had a lot of fun when we went out to take family photos. Here is the photo we used for our card this year. Two weeks until Christmas! I'm not nearly ready, but I'm not stressed. I'm enjoying the season, doing some shopping, doing some baking, watching Christmas classics and Hallmark movies. Enjoying time with these sweet people who share my life. I'm grateful. I've Been Shopping, Have You?